Looking down onto the ground surface of a road at Abwong. 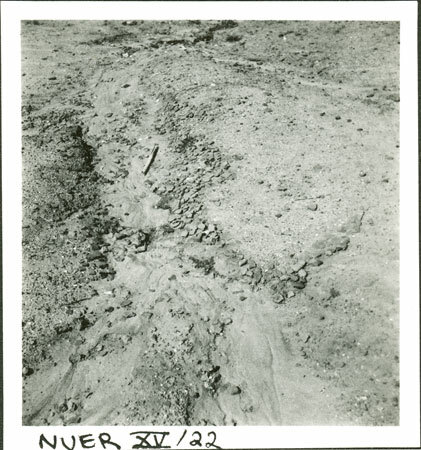 The focus of interest is the area of cobbling visible in the centre of the image (partly washed away by the rains), which would have required much labour recruited by the administration from the local population. Note on print reverse ms pencil - "04 4" & print front border ms ink - "NUER XV/22"
Morton, Chris. "Pavement at Abwong" Southern Sudan Project (in development). 03 Jan. 2006. Pitt Rivers Museum. <http://southernsudan.prm.ox.ac.uk/details/1998.355.711.2/>.